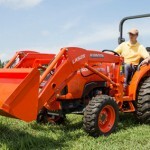 Kubota Tractor Corporation today announced that the latest recipient of a donated tractor in its “Geared To Give” program is farmer veteran Chad Tackett, owner of Tackett Family Farms in Lincolnton, Georgia. 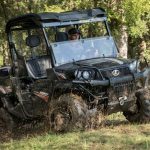 During a special ceremony, Tackett was presented with the keys to a new Kubota L-Series compact tractor in recognition of his years of service in the U.S. Army and for his dedication to farming. 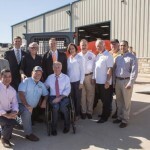 The donation was made by Kubota in partnership with the Farmer Veteran Coalition (FVC), in an effort to provide financial support and donated Kubota equipment to U.S. military veterans pursuing a future in farming. Tackett and his wife Shirlene, a U.S. Air Force veteran, manage roughly 200 acres of land including planted pines, hardwoods and pastures where they raise grass-fed Texas Longhorn cattle. Tackett grew up feeding cattle and raising hogs on family farms, and with his experience and new Kubota tractor, he plans to develop the farm and expand his cattle operation to sell meat locally by late next year. A father of four, Tackett’s son Zach serves in the U.S. Navy where he is stationed in King’s Bay, Georgia. Tackett served in the U.S. Army for 22 years where he was stationed across the U.S. and overseas before retiring in 2012. After retiring in 2012, Tackett learned all there is to know about grass-fed cattle with the hopes of starting his own operation. With his new Kubota tractor, Tackett will get his farm in the proper condition to raise more animals and plant vegetables to sell locally, in addition to selling grass-fed beef. He also offers his farm as a place for local veterans to work or relax, providing a therapeutic environment and allowing them to start their own farming projects. 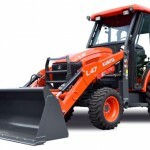 Farmer veterans can apply to the FVC Fellowship Fund in order to be considered for donated Kubota equipment through the “Geared to Give” program. 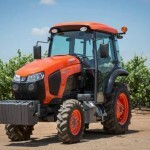 Kubota has selected its Standard L-Series compact tractors for this program, as their versatility and efficiency are ideal for meeting the varying needs of many small- and medium-sized farming operations. 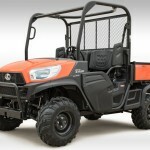 For more information about the “Geared to Give” program, visit www.kubotacares.com. To learn more about FVC, visit www.farmvetco.org.